Craftster Community > CROCHET > Amigurumi: Discussion and Questions (Moderator: pottermouth) > Stuffie/Amigurumi makers - which way do you crochet? Stuffie/Amigurumi makers - which way do you crochet? There is no right or wrong way to do this... but I am curious.. Which way do you crochet??? Which way do YOU do it??? Re: Stuffie/Amigurumi makers - which way do you crochet? I use both ways, depending on which way is more comfortable for holding the piece. I think usually I start off along the inside and then turn it inside out and crochet along the outside when it gets a bit bigger. My blog - come visit me! BTW, I love that hook - is it okay to have hook envy?? Hook envy is perfectly acceptable...and even better after your *correct way*! It is my favorite hook - a Susan Bates bamboo handled one... but then what are friends for if we can't want what the other one has, aye? Sarah likes to make stuff. I noticed right away that it made the crochet inside-out, but it still looks good. Later I figured out how to do it from the outside, and now I do it both ways. It does look different when you are examining stitches closely, but the overall effect is the same--you still get a little animal in the end. I like having the options. I want to add on a question--what size hook do you use? I use an F.
I always learned to do it on the outside. Outside, so the correct side shows out from the beginning. I'm pretty sure this is technically the correct way to do it, since you would otherwise have to turn the piece inside-out to have the outside stitches facing outwards. Not that it's wrong to have the inside stitches on the outside, especially when working with furry yarn. I work along the inside. I prefer the inside track myself. Just like the way it feels really. I crochet on the outside, but I have no idea how to do it on the inside. I am an outside person myself and honestly didn't know there was another way to do it. I must echo the hook envy. So pretty. . . I still love those hooks. They are all that I will use. They really are super comfortable. You totally need to get some - I get mine at Hobby Lobby. They are the only place that used to sell them in town but Joann's just opened up - a small, dinky one sad to say but at least it is a Joann's - and they carry them as well. I am not sure if AC Moore or any other stores carry them. I know my Michael's, Walmart and Hancocks do not. I crochet along the outside but sometimes you just have to do it the other way for certain projects. It's really whatever feels more comfortable to you. And I don't have hook envy because I've got a whole set of the bamboo handled ones. They are some of my favorites to work with, but I've also got some Clover Takumi Soft Touch, Chiao Goo, and Tulip Etimo ones that I enjoy. I get these guys online since there are limited choices where I live. Definitely check out inline vs non-inline hooks first though, so you know what you're getting. 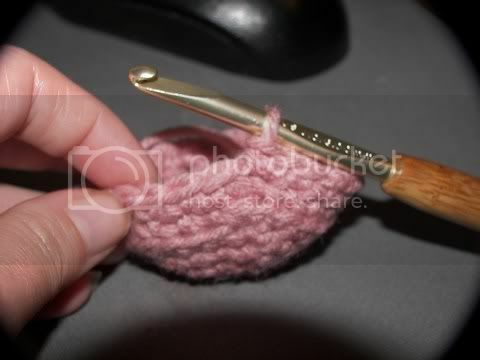 I actually crochet using joined rows (seriously, am I the only one? ), so I alternate inside-outside every row. 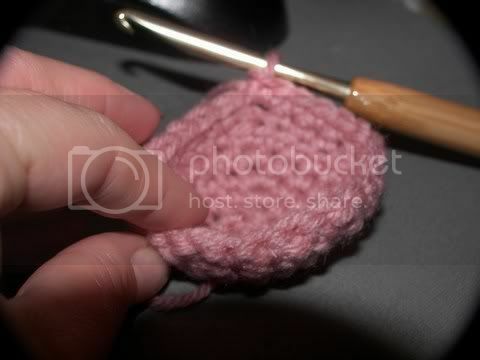 But back when I did continuous rounds, I normally crocheted along the inside. I crochet along the outside. I never even thought to do it on the inside. It's really useful to hear that it can be good for the furrier/fluffier yarn. I've made a few amigurumis using fluffy yarn and I found it pretty tricky, because I couldn't even see my stitches. I think I might try crocheting along the inside the next time I use that yarn again. I'm interested in personal swaps. For a project I'm in need of Christmas countdown inchies! If you're interested and/or want more information feel free to pm me. Most of the time I crochet along the outside. There was one project - a large bag - that it was easier to put the yarn in the bag and crochet along the inside! On Amigurumis I always crochet on the outside, especially on legs/arms/tails where I put my pinkie inside the shape I am crocheting so that it is easier to find each st!